14 "Yemen, Iran, and Wall Street’s Drive For War"
Caleb Maupin is a member of the Workers World Party. Married to Meches Rosales-Maupin. Caleb Maupin is a radical journalist and political analyst who lives in New York City. Originally from Ohio, he studied political science at Baldwin-Wallace College. In addition to his journalism, analysis, and commentary, he has engaged in political activism. He is a youth organizer for the International Action Center and was involved in the Occupy Wall Street movement from its planning stages in August 2011. He has worked against police brutality, mass incarceration, and imperialist war. He works to promote revolutionary ideology, and to support all who fight against the global system of monopoly capitalist imperialism. Because we must demand that the needs of the people come before the greed of the super rich. Millions are jobless and homeless, and millions more will be living on the streets if the government continues to waste trillions of dollars on saving wealthy bankers instead of saving people. 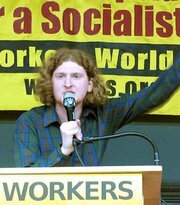 Caleb Maupin became involved with Workers World Party-front, Moratorium NOW! in its early days. Moratorium NOW! formed in the spring of 2008 to fight for the passage of Senate Bill 1306, now numbered SB 29, "which would stop all mortgage foreclosures and evictions for two years." 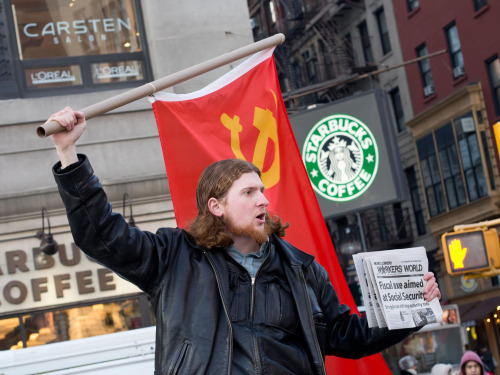 In 2012 Caleb Maupin was a leader of Red Youth. Caleb Maupin attended the 2013 WFDY youth festival in Ecuador with Daniel O'Brien, Adjoa Achiaa, Colleen Gillan, Ranjeet Brar, Andy Katz and Bao-Hanh Tran. In January 2017 Caleb Maupin was a correspondent for Iran's PressTV. Caleb Maupin addressed the "The Struggle Against Racism, Zionism, and Imperialism within U.S. Borders, 3rd New Horizon Conference: On The Brink, 27-29 October 2015, Tehran Iran. The audience rises for the Iranian National Anthem and the Black National Anthem "Lift Every Voice." Amazing conference so far! Black freedom fighters welcomed to Tehran by Islamic Revolutionaries. With Iranian ambassador Gholami Khooshroo — with Meches Rosales-Maupin at Headquarters of the United Nations. "Yemen, Iran, and Wall Street’s Drive For War"
Featured speaker: Caleb Maupin, a Press TV journalist and activist from New York, will share his experience on an Iranian humanitarian aid ship that was bound for Yemen in May. Saudi Arabia destroyed the entire port that the ship was headed for with the backing of U.S. Imperialism. Caleb will share a first hand view of Iran which is constantly vilified in the U.S. Press, and will discuss the current state of Iranian-US relations in light of the recent U.S.-Iran non nuclear proliferation treaty. Saturday, August 22nd 2016, 5920 2nd Avenue, at Antoinette, Just North of Wayne State University, Detroit. 5:00 pm – 8:00 pm. The war in Syria must be brought to a speedy conclusion, and in this context we welcome Russia’s intervention. We want the backers and appeasers of ISIS purged from the U.S. government. Assad’s government must be kept intact, and ISIS must be destroyed. The Jarablus corridor, a 100 km/60 mile stretch along the Turkish Syrian border, is the key to this entire situation. The supply lines of ISIS and other terrorist groups come out of Turkey, where terrorists are sheltered and protected, and go from there into Syria. ISIS’ ammunition, fuel, spare parts, and recruits can only come through the Jarablus corridor. This necessity was even mentioned by a White House official last autumn. But so far no nation on or off the United Nations Security Council has done what is necessary to cut off supplies passing through the Jarablus corridor. This gathering condemns the blatant support for terrorism being provided by Turkey and Saudi Arabia. The United States government must stop supporting these treacherous powers. We call on the governments of Russia, the United States, Iran, the United Kingdom, France, Germany, China, and all others to act at once to close, block, and interdict the 100 km wide Jarablus corridor along the Turkish-Syrian border. If this is done, ISIS/ISIL/Daesh/IS/Islamic State/Caliphate will collapse, since the anti-Assad forces fighting in Syria receive decisive logistics and personnel from abroad, especially through Turkey. A second point concerns the growing threat of fascism here at home, with special reference to the presidential candidacy of Donald Trump and also the renewed activities of armed fascist gangs in Oregon and elsewhere. Trump demands the immediate deportation of 12 million Latinos. Trump wants to stop all Moslems at the U.S. border. Trump wants a registry of Moslems, obviously, as a preparation for concentration camps. Trump says that wages are too high and that the minimum wage should no longer exist. All this adds up to a brutal fascist police state in the United States. Trump is the classic fascist billionaire, a type who ought to be familiar to everyone from the catastrophic experience between the two world wars of the last century. He uses Gestapo tactics at his rallies, inciting his goons from the podium to beat up protesters. The coalescence of the Trump campaign with the armed fascist gangs in Oregon is already beginning, through the mediation of radio programs like Michael Savage’s Savage Nation. Historical experience shows that fascist movements and organizations must be nipped in the bud, before they become too strong to be dealt with. This gathering therefore calls on all persons and organizations to expose, denounce and oppose the presidential candidacy of the fascist Donald J. Trump. Up to the point of passage of the above resolution, the panel had spent the evening discussing and contending over how a broad coalition could be formed to counter the threats of fascism and war. Benjamin Lawton, a cousin of police brutality victim Eric Garner, was a surprise guest to the panel and opened the evening’s discussion. Other panelists included journalist and political activist Caleb Maupin, Christopher Rieth of the Tax Wall Street Party, Sumumba Sobokwe of Occu-Evolve, blogger and Bernie Sanders supporter Paul Shepard, Dakem Roberts of Resist Rikers and the New Afrikan Communist Party, and George Greene of Party of Communists, USA. Audience participation was welcome and many took the opportunity to speak. Coming from such diverse places as Washington D.C., the New York metropolitan area, upstate New York, Greece, Germany and China, a broad spectrum of ideas and criticisms were brought forward. The audience members included Bernie Sanders supporters as well as progressive activists from a variety of political backgrounds, including anarchists, liberals, black nationalists and communists. Future meetings and actions are to be planned as a coalition is formed on this platform and the evening’s resolution. 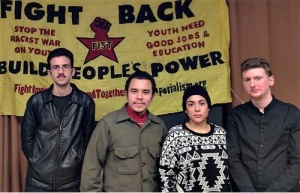 The New People’s Front intends to approach the emerging progressive upsurge with both anti-fascist and anti-imperialist politics. On April 8th, 2017 in Union Square SYNA activists Caleb Maupin, Dakotah Lilly, Dyln Namm and Nick Maniace were hard at work handing out flyers, talking to New Yorkers about Syria, the United States government, and politics in general, selling the book “What’s next for the Political Revolution”, and otherwise recruiting members for SYNA. 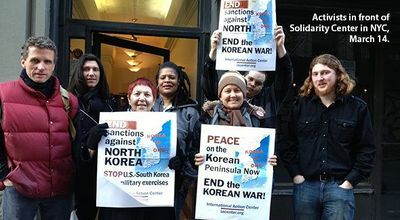 Hundreds of flyers were given out and the overall consensus of the public varied from saying the United States of America needs to keep its military out of foreign countries affairs, to fully supporting the United States and its foreign policy. Overall the day was a huge success for the Students and Youth for a New America as we made many contacts from nearby colleges and other interested individuals. SYNA organizers Dakotah Lilly and Dyln Namm with Venezuelan Ambassador to the UN Rafael Carreno, and Solidarity Activist William Camacaro, and journalist Caleb Maupin. In October 2017 Caleb Maupin and Dakotah Lilly were at the World Federation of Democratic Youth festival in Sochi Russia. This page was last modified on 1 February 2019, at 05:06.